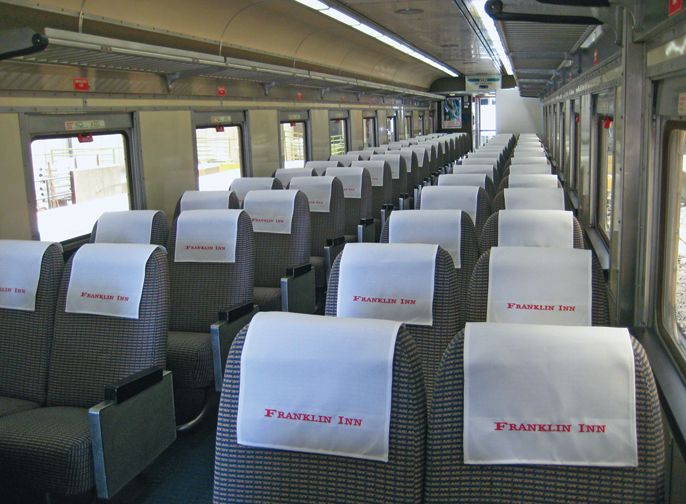 High-capacity day-excursion coach complete with upholstered cushioned rotating seats. Tinted windows, overhead luggage racks and two new restrooms. Car is accessible to the physically challenged with wheel chair lock-down and one accessible restroom. Push-pull equipped. Budd-built in 1949 for the Pennsylvania Railroad as a Tuscan Red 21 roomette sleeper. It was rebuilt in 1963 by the PRR into a coach for service on the Northeast Corridor for the New York World’s Fair (exterior livery is restored to this era.) Later, it served in SEMTA and MARC commuter service prior to acquisition and refurbishing by DCNRHS.